Welcome to the new look WDW Magazine version 2.0. This month we show off our brand new look as we talk about Fall Food and Fun. We say this almost every month, but this month’s issue is one of our biggest and best ever. Wow, we have over 150 pages packed with incredible pictures, great information and some really cool videos. 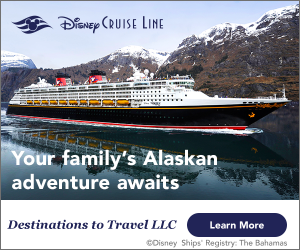 We kick off our Fall Food and Fun with a look at the Disney Dining Plan, Advanced Dining Reservations (ADRs), the International Food and Wine Festival and the Premium Events at this years Festival. Oops, let’s not forget Mickey’s Not So Scary Halloween Party. That’s just the first section. Food and lots of Fall Fun. Our other sections are just as jam packed. Helping Hands has our First Timers Corner where we talk about if you will save money on the Disney Dining Plan. Then our great photographers talk about taking pictures of food. Yummy. In Bring the Magic Home we have a Spooky Haunted Mansion Treat and the recipe for the Cheddar Cheese Soup from Le Cellier. The Best of WDW takes us to the Jungle Cruise, the Treehouse Villas, Cape May Cafe and the Screen Door General Store. The FanZone asks the burning question “What is your can’t miss snack at WDW?” along with meeting Laurie and Kathleen, learning about the magic of dressing up for WDW, our Vinylmation corner and this months photo contest. Wait, there’s more. In August, some of the WDW Magazine Team was at the D23 Expo in Anaheim. We had a great time so we thought we’d do a special insert this month recapping the Expo. We’re still going. 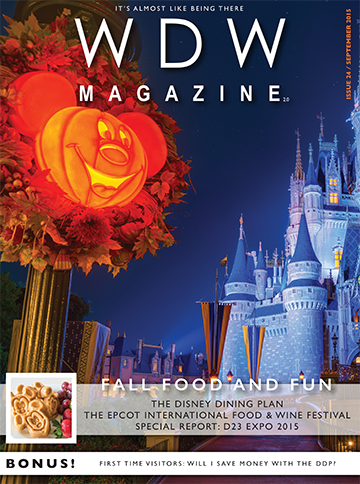 In our Around the World Section there’s the monthly news from WDW, some fun facts about the Food and Wine Festival, a look at some of the seasonal characters, a throwdown between Test Track and Radiator Springs Racers, and this month in Disney History. Whew. I told you this was a massive issue.